#1 ranked Tabor (15-0-2) had about as dominant a week as a team could, sweeping Andover, Lawrence Academy and St. Mark’s by a combined score of 19-2. Three more games loom this week, including a big one Friday at St. Paul’s. Middlesex will be Wednesday’s opponent and Governors Academy on Saturday. #2 Williston (16-1-1) had all it could handle in its only game of the week, edging Taft 3-2. The Wildcats return back to action this week seeing Choate Wednesday. Coach Christa Syfu’s club will be at Andover on Saturday in a key matchup. It was a workman-like week for #3 Nobles (16-0-5), which dispatched D2 ranked teams St. George’s (5-0) and Brooks (3-1). 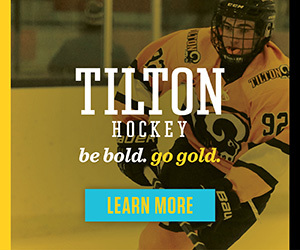 The Bulldogs look ahead to Groton (Wednesday), BB&N (Friday) and Westminster (Saturday). #4 Loomis Chaffee (11-2-4) had a mild week, a 4-1 win over Gunnery its only action. The Pelicans are off until road games Friday at Cushing and Saturday at Choate. St. Paul’s (15-2-2) survived one-goal wins over St Mark’s (3-2) and New Hampton (2-1) and is at #5. They host Tabor in the game of the week Friday, and will be at Pomfret Saturday. #6 Kent (11-4-0) made it two solid wins in a row with a 5-2 win over #7 Hotchkiss. The Lions face Canterbury (Wednesday) and Millbrook (Saturday). The Bearcats (9-3-2) under first-year head coach Corey Cooper, get Taft (Saturday) and Lawrenceville (Sunday). #8 Deerfield (11-6-2) dropped a 3-2 decision to Winchendon. Westminster (Wednesday) and Berkshire (Saturday) are on this week’s docket as the Big Green looks to remain in playoff contention. Phillips Andover (8-4-3) is back in the Top 10 this week at #9, after the Big Blue’s big 5-1 win over New Hampton Saturday. PA has Lawrence Academy Tuesday before welcoming Williston to town. Also back in the rankings this week at #10 is Phillips Exeter (10-5-3). The Big Red have road games at Kimball Union (Wednesday) and New Hampton (Saturday).